The kitchen is the heart of the home. But many older homes feature kitchens with excessive doors, poor circulation, antiquated and oversized walk-in pantries and minuscule breakfast alcoves. These poor design elements clog the flow and enjoyment of your prime living space. Simply removing a wall between the kitchen and the dining room can make a huge impact in a once cramped galley kitchen. Or a more complicated transformation of a kitchen’s adjacent garage into an open family room/kitchen space can make your home feel like new. Our award-winning architects and interior designers will assess your kitchen’s current layout and envision a new design – one that transforms unused space into a cohesive and contemporary open plan kitchen. Whether you mainly use the kitchen to cook for your family or you love to entertain and have guests over, the kitchen should look and function how you want. At LaMaison we love kitchen remodeling projects; they provide the perfect space for a fusion of function and design. A thoughtful kitchen remodel can add value to your home and transform a formerly cramped room into a custom space that suits your every need and stylistic preferences. We begin every kitchen remodeling project with research and base our design on the homeowners’ needs and desires. Many years of experience have shown us that a truly beautiful kitchen is one that is functional and aesthetically pleasing. We have successfully built and designed hundreds of kitchen in the greater Sarasota/Bradenton area. Your kitchen sets the tone for the rest of your home, the kitchen has the ability to not only provide a meal, but a complete experience. It is your home’s most used room, whether it is for the preparation of family meals or for dinner parties with close friends. It’s no surprise then that kitchens are one of the first rooms homeowners wish to renovate. Such remodeling presents the opportunity for the perfect union of function and design, a trademark of LaMaison premier design-build firm. Smart and thoughtful remodeling improves not only the value of your home but also everyday enjoyment. Kitchen remodeling produces the highest return on investment, as American families spend more time and do more entertaining in and around their kitchens. At LaMaison, we’ve assembled an award-winning team of kitchen remodeling designers and craftsmen who devote themselves to floor planning, ergonomics, surfaces and textures, cabinetry, appliance selection and energy conservation. The kitchen is the heart of your home. The space where meals and memories are made. There is no better way to increase the value of your home than by updating your kitchen. 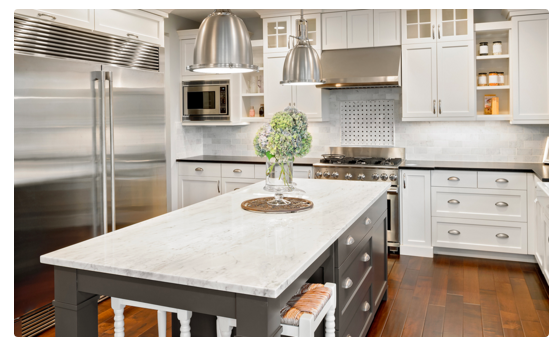 From custom cabinets, new countertops and backsplashes, to new floors and appliances, LaMaison can help you with your kitchen remodel. LaMaison specializes in custom kitchen remodeling and design-build in the Lakewood Ranch, Manatee, Sarasota and surrounding counties. Call us for a free consultation today at 941-779-7170 or send us an email and we will contact you promptly!